مقاله ارزیابی عملکرد شرکتهای پتروشیمی ایران با مدل تعالی پایدار در فصلنامه Safety Science به چاپ رسید. این نشریه دارای نمایه SCOPUS-JCR- WOS است. این نشریه در انتشارات معتبر Elsevier نمایه است و ضریب تاثیر آن در پایگاه تامسون رویترز ۲٫۳۷۸ است. جهت دسترسی به چکیده مقاله بر روی لینک کلییک کنید. 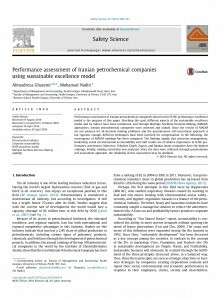 Performance assessment of Iranian petrochemical companies based on the H3SE performance excellence model is the purpose of this paper. 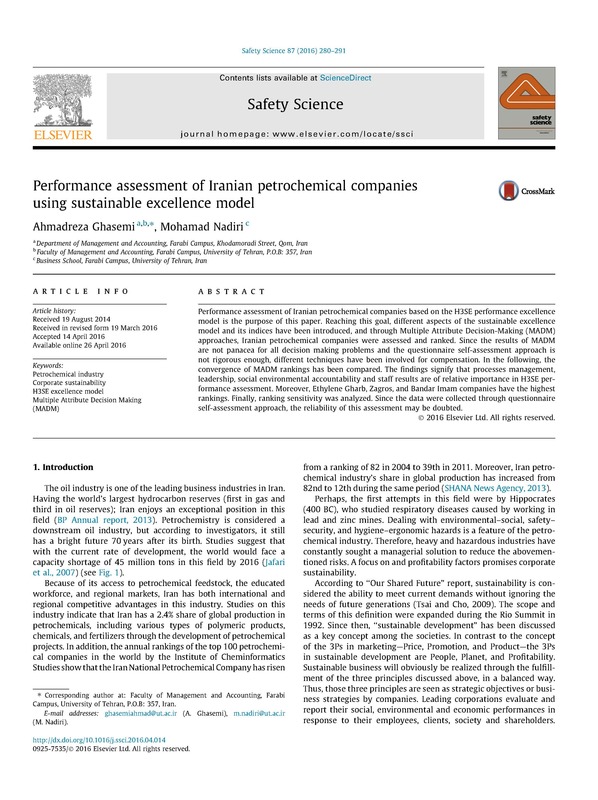 Reaching this goal, different aspects of the sustainable excellence model and its indices have been introduced, and through Multiple Attribute Decision-Making (MADM) approaches, Iranian petrochemical companies were assessed and ranked. Since the results of MADM are not panacea for all decision making problems and the questionnaire self-assessment approach is not rigorous enough, different techniques have been involved for compensation. In the following, the convergence of MADM rankings has been compared. The findings signify that processes management, leadership, social environmental accountability and staff results are of relative importance in H3SE performance assessment. Moreover, Ethylene Gharb, Zagros, and Bandar Imam companies have the highest rankings. Finally, ranking sensitivity was analyzed. Since the data were collected through questionnaire self-assessment approach, the reliability of this assessment may be doubted. Corresponding author at: Faculty of Management and Accounting, Farabi Campus, University of Tehran, P.O.B: 357, Iran.